Japanese cuisine is very popular around the world. 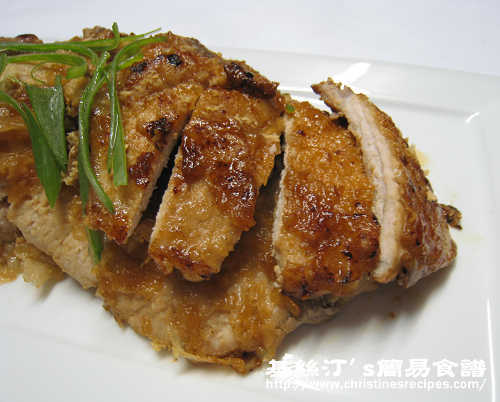 Some famous Japanese dishes would call for ginger sauce or ginger for seasoning, just like this Pork Chops in Ginger Sauce. In many Japanese restaurants, you can easily find this dish in their menus. It’s very popular, yet might cost you a lot in certain Japanese restaurants. How about cooking it at home? Yeah, I tried it a few weeks ago. The taste was similar to the ones in a set lunch I tasted in a nearby Japanese restaurant, but I only spent a few dollars on cooking this dish to feed my whole family. It’s worth trying. Adding some cooking sake (Mizkan) makes a big difference in tasting the pork chops. Yummy! Rinse pork chops and drain well. Tenderize them with the back of a chopper. Marinate for at least 1 hour with the marinade. Use a little bowl, mix seasoning ingredients together. Heat 2 tablespoons of oil in a frying pan. 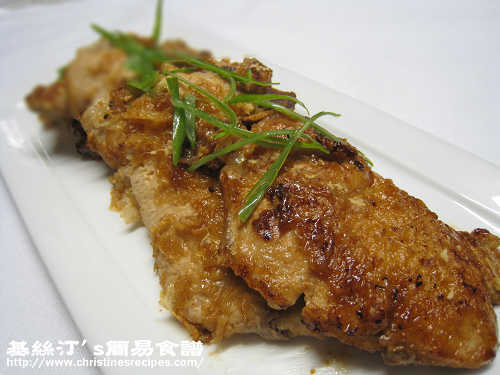 Lightly coat marinated pork chops with cornflour and shake off the excess. 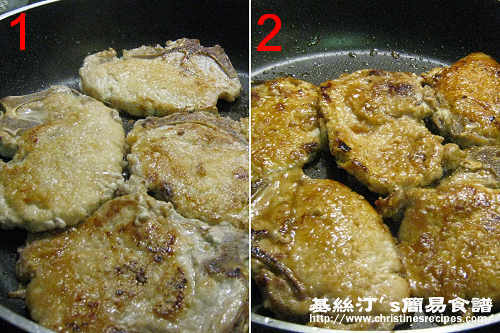 Fry pork chops on medium heat until both sides are brown and cooked through (see picture 1). Pour in the seasonings over pork chops. Turn heat to high level, stir well, cook until sauce dries up (see picture 2). Dish up. Serve with more grated ginger if you like. Just made this for dinner tonight. It was so easy and delicious! Sorry, I'm a little confused. Step 1 says marinate pork chops for an hour. What do you marinate with? And the steps don't mention the thickening. When does that go in? Thanks for asking. I've missed out the part of marinade. Sorry for the confusion. Just updated the recipe.